Born to the nobility, the daughter of Nikita and Marina, Athanasia grew up in a pious family. She early felt drawn to the religious life; legend says that when she was a young girl learning to weave, a star suddenly appeared, settled over her heart, and she was enlightened. However, at her parent's request, she married at age 16 to an army officer. Widowed after 16 days of marriage when her husband died in battle against invading Arabs. She again considered the religious life, but an imperial edict required all single women of marriage age to marry soldiers. Her second marriage was to a deeply religious man; the two conducted Bible studies in their homes, and took in the sick and poor. Her husband felt drawn to become a monk, and Athanasia agreed with his new vocation. She became a nun, gave away the bulk of her possessions, converted her home into a convent, obtained a spiritual director named Matthias, had other sisters move in with her, served as abbess, and lived a life of severe austerity. She built three churches. The community later moved to Timia where Athanasia became widely known for miraculous healings. To escape the press of people who were drawn to her reputation of holiness, and return to the quiet, prayerful life, she and two sisters fled in secret to Constantinople where she lived as an anchoress in a cell for seven years; while walled away, she was an advisor to Empress Theodora. Obeying the appeals of her sisters, she returned to Timia very late in life, and spent her last days there. Many stories have come down to us about Athanasia, most concerning her activities after death. During Mass at the convent, forty days after Athanasia's death, two of her sisters received a vision of Saint Athanasia at the gates of heaven. There, two radiant men placed a crown with crosses on her head, handed her a brilliant staff and led her through the gates to the altar. Shortly before her death, Athanasia left orders that the poor be fed in her memory for forty days. Her sisters, however, set up a memorial trapeza, a dining hall where religious and pilgrims to gather for food, for only nine days. Athanasia appeared to some of the sisters and said, "It was wrong that you did not fulfill my testament, the forty-day commemoration in church of those who have fallen asleep and the feeding of the poor greatly helps sinful souls, while heavenly mercy is sent down from righteous souls to those who carry out the commemoration." She then jabbed her staff into the ground, and became invisible. The next day, the staff had sprouted and become a living sapling. A year after Athanasia's death, a possessed woman was brought to her grave. The people with her dug up the earth over the grave, hoping that contact with it would heavel the woman. They smelled a perfume coming from the grave, and removed Athanasia's coffin. When she touched it, the possessed woman was healed. The witnesses opened the coffin, and found Athanasia's body incorrupt, streaming fragrant myrrh. When these witnesses found the body in this state, they transferred it to a new ark. Her sisters, wanting to clothe the body in silk, removed the hair shirt Athanasia had worn in life and death. However, when they tried to put the silk clothes on her, the body developed severe rigor, hands clasped to the breast, and they could not dress her in the rich dress. The sisters took this as the Athanasia's love of pious poverty. One of the sisters called out to the saint, "O our lady, as thou didst unquestioningly obey us while thou didst live with us, so even now be well pleased to obey us and be clothed in these garments, our humble gift offered unto thee." The body then sat up, extended her hands, and was dressed in the silk clothing. 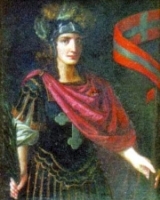 The son of Marchese and Fiordonina Oldo, his father died when the boy was young, leaving him a legacy that allowed to grow up a rich and self-indulgent youth. Married to Catharine Bocconi, a woman of similar disposition; father of three children. The death of a friend to disease brought his own mortality to James' attention and matured him slightly. Then one day a travelling reproduction of the Holy Sepulchre came to his home town of Lodi, Italy. As a joke, James lay down on it to compare his height to Christ's. While lying there, he had an almost instantaneous conversion experience. He became a Franciscan tertiary. James took care of a sick priest who, in return, taught him Latin. His mother and wife were opposed to James's change until his mother had a vision of being before the judgement seat of God. Both women became Franciscan tertiaries and turned their mansion into a center for prayer. They and spent their later years working with the sick and the prisoners taken in the civil war that devastated Lodi. Upon his wife's death, James became a priest in 1397. His acts of penance became so severe that his bishop had to order him to eat at least three times a week. Preacher whose life and words moved many to enter the religious life. Had the gift of prophecy; predicted wars and his own death. Daughter of a French government official named Nicholas Aurillot. Educated at her aunt's convent at Longchamps. Though attracted to religious life, she married Pierre Acarie, an aristocrat and treasury official, at age 16. Mother of six, three of whom became Carmelites, and one a priest. Peter supported the Catholic League against Henry IV. When Henry became king he seized the Acarie estates, impoverished the family, and exiled them from Paris, France. Barbara went to court over the matter, won, and reclaimed part of the family fortune. 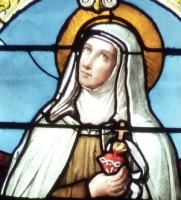 She was devoted to the writings of Saint Teresa of Avila, and became active in charities. Her good works eventually won her the admiration and support of King Henry. Brought the Discalced Carmelites of Saint Teresa to France, founding five houses between 1604 and 1609. Widowed at 47. Carmelite lay sister in 1613 at Amiens, France, taking the name Mary of the Incarnation. Spiritual student of Saint Francis de Sales. Known for receiving visions and ecstasies, and for supernatural gifts. Born to an impoverished Spanish noble family. Educated by his uncle who was a chaplain in the cathedral of Murcia, Spain. Andrés worked and saved for several years to build up funds to provide for his sister’s marriage and help support his parents; while taking it to them he was attacked by thieves who took it all. He took this as a sign from God that worldly riches had no value, and vowed to devote himself to spiritual riches. He joined the Franciscan Friars Minor in Albacete, Spain on 1 November 1557. He made short pilgrimages to Marian shrines, visited the sick with priests, and spent endless hours in meditation and prayer during Eucharistic Adoration. He moved to the Alcantarine reform convent of San José in Elche, Spain in February 1563; in 1564 he was there when Saint Paschal Baylon received the habit. Assigned to establish a convent in Valencia, Spain, he became a close friend of Saint Juan de Ribera. Second daughter of Celso and Matilde Venturini. At age 10 she read a life of Saint Catherine of Siena, and immediately developed a devotion to her. Savina made her First Communion at age 12. Joined the Congregation of the Daughters of Mary at age 15 and was in was chosen president of the Congregation in 1873. In 1869 she had an audience with Pope Pius IX who urged her to walk in the footsteps of Saint Catherine of Siena. On 15 August 1873 she and five companions, in the chapel of her family’s home, took vows of chastity, poverty and obedience in order to found the Sisters of the Poor of Saint Catherine of Siena whose mission is to care for homeless and poor young people. The Sisters founded their first house in Onano, Viterbo, Italy in 1881, their first foreign mission in Belem, Brazil in 1903, and received final approval on 17 June 1906 by Pope Pius X. The Congregation continues her good work today in Italy, Brazil, Argentina, India, Philippines, Paraguay and the United States with over 80 houses and more than 500 sisters. Court page and courtier to the Count of Flanders, Belgium. Canon priest of Veurne, Belgium in 1135, a position he resigned to become a Cistercian monk at the abbey of Our Lady of the Dunes on the sand hills between Dunkirk and Nieuport. Abbot there for 12 years. Son of Saint Anthia of Illyria; his father died when the boy was very young. Educated by Bishop Dynamius. Bishop of Illyria, Dalmatia (in modern Croatia) at age 20. Arrested for bringing an imperial Roman official to Christianity. Martyred in the persecutions of Hadrian along with his mother and eleven other Christians whose names have not come down to us. Born to the Venetian nobility. Ordained on 13 March 1813. Priest in the archdiocese of Venice, Italy. Founded the Institute of the Teaching Sisters of Saint Dorothy. Founded the Pious Society of Saint Dorothy. Priest. Accosted on the street one day by Moors who asked his opinion of Jesus and Mohammed, promising no harm to him no matter the answer. Perfecto explained the Jesus was the Son of God and our Savior, while Mohammed was a false prophet. When his questioners felt that enough time had passed that their promise has dissipated, they had Perfecto arrested, tried, and executed by a Muslim court for blasphemy. Martyr. Milanese noble. Priest. Chancellor. Archdeacon. Supported the Roman Pope during the schism of 1159. Fled Milan, Italy in 1161 when Frederick Barbarossa besieged the city in support of the anti-pope, yet was still elected bishop. Cardinal in 1165. Archbishop in 1166. Papal legate to Lombardy. Returned to Milan after the war and helped rebuild it. Died in the pulpit immediately following a sermon against heresies. Son of Cairel. Student of Saint Murin of Fahan. Hermit on Holy Island, Lamlach bay. Ordained by Pope Saint Gregory the Great in Rome, Italy. Consecrated bishop by Pope Honorius I. Apostolic Legate to settle the question of the Easter observance. Priest in the archdiocese of Warsaw, Poland. Imprisoned, tortured and abused to death for his faith during the Nazi persecutions. Wife of Saint Hidulphus of Hainault. They separated to enter religious life, Agia becoming a Benedictine nun at the abbey at Mons, Belgium. Widow. Legend says that she managed to avert an injustice by speaking from the tomb. Priest of the diocese of Angers, France. Martyred in the persecutions of the French Revolution. Abbot of the Benedictine abbey at Lobbes, Belgium c.689. Trained Saint Dodo. Missionary bishop. Helped found Aulne Abbey and the Abbey of Wallers-en-Faigne, France. Officer in the army of Emperor Hadrian. Convert. Martyr. Connected in old writings with Saint Faustinus and Saint Jovita. Abbot at Ellwangen, Germany. Founded monasteries at Füssen, Wessobrunn and Kempten in Germany. Bishop of Augsburg, Germany. Mother of Saint Eleutherius of Illyria. Martyred in the persecutions of Hadrian along with his mother and eleven other Christians whose names have not come down to us. Imperial Roman prefect of Messina, Sicily. Converted to Christianity by Saint Eleutherius. Martyred in the persecutions of Emperor Hadrian. Courtier to Shapur II of Persia. Martyr. Sixth-century monk in Wales. Travelled with and helped Saint Finian of Clonard in his work in Ireland. Eighth-century monk at Kildare, Ireland. Wrote a biography of Saint Brigid.